A crack in one of the bluffs along Sunset Cliffs poses a danger to people walking above and below the popular vista in Point Loma. The area affected is at Sunset Cliffs Park and not in an area with a lot of pedestrian access. City officials have put up yellow caution tape to warn people not to walk on the unstable rock. Professor Emeritus of Geology, San Diego State University Pat Abbott said he had visited the area Tuesday and in his opinion, one day later it looked as if the crack in the rock had widened. He said gravity and the steepness of the cliffs in addition to the tides are to blame for the change in the rock formation. 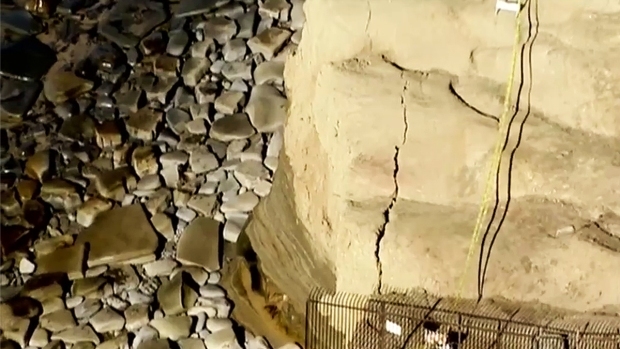 Aerials of the crack along Sunset Cliffs in Point Loma, west of downtown San Diego. El Nino rains are the straw that broke the camel's back, not the sole source of this crack, according to Abbott.